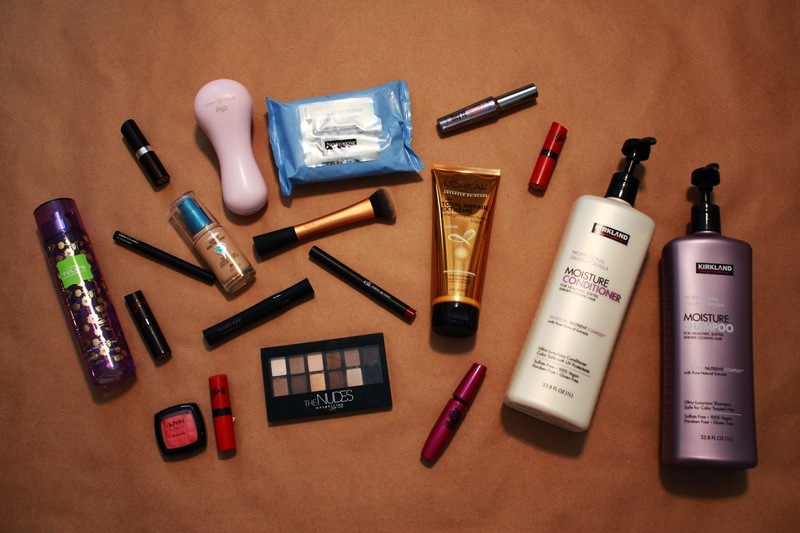 With 2014 coming to an end (which doesn't seem possible) I thought I'd take today to share my favorite beauty products of 2014! 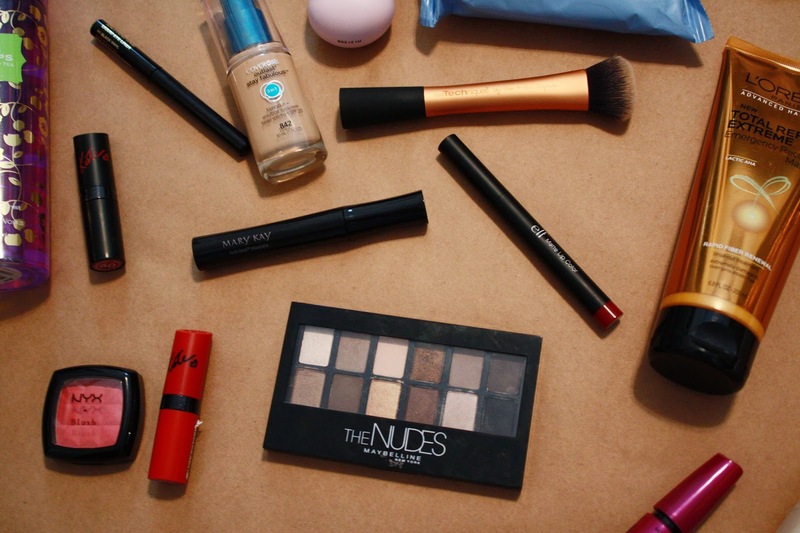 This year I've branched out in terms of beauty and makeup and really trying new products. I never use to wear blush and now I wear it everyday. I never was into lipstick and now I wear it quite often. About 99% of these products are from the 'drugstore' and are readily accessible. There are a couple that are 'high end' that cost a bit more but are totally worth it. Hopefully 205 will be an even better beauty year! 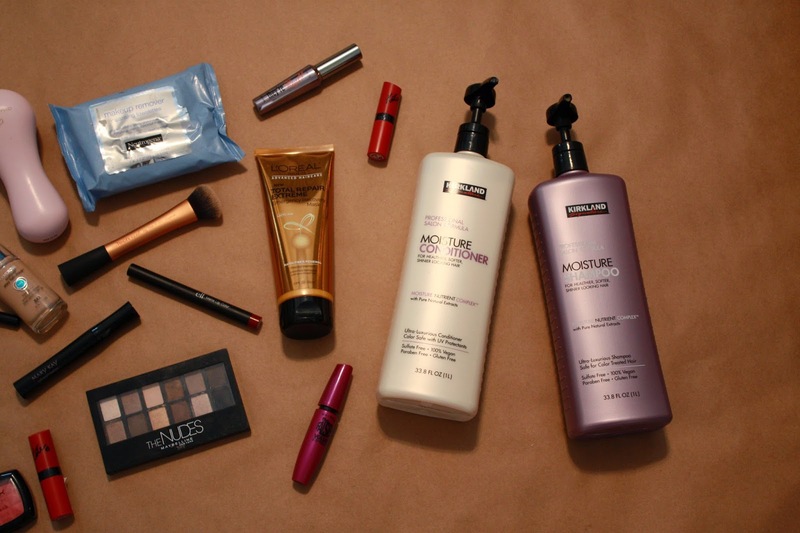 Onto the products, first up hair! Kirklands Moisture Shampoo and Conditioner// I first heard about this via CriminelleLaw's blog post about it. It was rumoured that it's made by Pureology, yes the high end, sell your soul for a bottle of shampoo and conditioner, Pureology. She bought it, tried it, reviewed it and was sold. So I went out and bought it too. Guys it's AMAZING! Now I've used various brands of shampoo and conditioner and I have never loved anything as much as this. It leaves me hair soft, silky, smooth and smelling good. Alliteration much Sam? I absolutely love this and will be repurchasing it whenever I run out. It's the best, go try it for yourself. L'Oreal Total Repair Extreme Emergency Recovery Mask// I remember hearing about this mask from various beauty gurus/Youtubers and bloggers but never paid any mind to it. It just seemed to far fetched that a drugstore hair mask could repair damage and make your hair healthier, shiner and smoother. I mean we've all heard that yik yak before. But after it kept popping up in videos and blog posts I decided to give it a try. BOY oh boy am I glad I did! It left my hair smelling great, smoother, shiner and softer. Not sure if it repaired any damage but it made it look just healthier! I'm a believer in this product. I think for the price it's a great product and if you're looking for a nice quality hair mask this is it. I will definitely be repurchasing! Neutrogena Makeup Remover Cleansing Towlettes// I've tried my fair share of makeup remover wipes. From Yes to Cucumbers and Blueberries, to Clean and Clear to even baby wipes. I just never found one I really, really liked, until these bad boys. I found these on clearance with a coupon at my local Target. I got over 200 wipes for like under $10. SCORE! I freaking love these things! They remove everything and I mean everything. They leave my skin feeling clean and not sticky or dry. If you're in the market for some wipes I highly recommend these! Clarosonic Mia// I've had this beauty for a couple of years now and have no intention of ever not using it. I had heard lots of good things about it and finally bit the bullet to invest in one. My skin has never been better and I don't know how I lived without it. It leaves your skin cleansed, exfoliated and just feeling clean and fresh. I use it in the shower most of the time and it really does a great job of cleaning my skin. I have noticed the clarity of my skin aka less acne and less dryness from using it. If you're hesitant because of the price tag it's sooooo worth it. I haven't had this nice of skin since I was a kid. With Christmas coming up it's the perfect gift to ask for plus stores that carry it are doing sales and promos! Bath and Body Works Raspberry Tea and London Tulips body spray// I bought this on sale awhile back and I wear it religiously. It smells amazing. It's not too overwhelming but gives just enough of a scent. I wear it night and day, everyday, through the seasons. It's a fragrance that, in my opinion, can be worn all year round. I definitely think this is my 'signature' fragrance of right now. Gah I love it. Covergirl Outlast Stay Fabulous 3-in-1 foundation// Isn't that a mouthful! I purchased this foundation just a few months ago and it's been the foundation I've been using everyday. I also heard about this via beauty gurus/Youtubers and decided to try it out and see if it was as fabulous as everyone thought it was. It is! The coverage is amazing (medium to full), it's not heavy or cakey or dry your skin out and it blends like a beauty. It's one of my favorite foundations and I'm a tried and true fan! Maybelline The Nudes Palette// I'm all about them nudes... palette that is. This is the drugstore's version of the Naked palette and while not identical it does a pretty good job. I love the variety of colors in it and for the most part the color payoff is quality. It has shimmer and matte shadows to create any look whether smokey eye, natural, dramatic or glam. If you're looking for an alternative to the pricey Naked palettes I definitely suggest checking this one out. It also makes for a great stocking stuffer! NYX Powder blush// I never use to wear blush, then one day I picked this NYX blush up from CVS and now I'm an everyday blush wearer. I love this color as it's a nice wearable, year round color. You can intensify it if you're going for more dramatic look or just a swipe for a very natural pinky, pinched cheek look. This is the only NYX powder blush I've tried but I am definitely hooked on them and want to try out more! Any color recommendations? Benefit 'They're Real' mascara// I got a travel size of this from Sephora awhile back and I have been a changed person. I have the shortest, wimpiest lashes known to man and woman. All you naturally long lash gals I envy you! This mascara makes them long, defined and thick. It actually makes it look like I have eyelashes! *GASP! * While on the pricier side of mascaras it's totally and completely worth it. If you have little lashes like myself, try out this bad boy. You can get a travel size on Sephora's website. It also makes for a great stocking stuffer! Lipsticks// Like blush I never wore lipstick. Maybe once in like my entire life. I just wasn't a lipstick girl. Until one night when I was going out and decided to add a bit of color to my outfit. I applied a beautiful deep wine color and BAM I was hooked. Since then I have purchased a few colors and have worn them quite often this holiday season. The Rimmel Kate Moss and regular kind are some of my faves for the price and quality you get. I also have an e.l.f. cosmetics matte red one and I love it! My next lipstick purchase? A NARS Audacious one. What a beaut it is. Mary Kay Lashlove mascara// So I'm kinda obsessed with mascaras. I'm definitely a mascara kinda girl. I found this one and it was love at first sight, literally. It makes my lashes suuuper long and separates them making them appear fuller. It's a pretty natural mascara but can be built up to more dramatic lashes. I'm obsessed and will 100% repurchase. Maybelline Falsies mascara// My last mascara which is my holy grail mascara is my Falsies. I know it's a divided mascara as some like it and other's don't. I absolutely love it! It makes my lashes super thick and well false like! I'll apply either They're Real or Lashlove as my first coat then Falsies as a second and instant lashes! It's my absolute favorite and I will buy time and time again. In my opinion it's the best drugstore mascara but hey that's just me. Milani Ultrafine Liquid Eyeliner// Liquid eyeliner scared the crap outta me to be honest. I'd see beauty gurus/Youtubers apply it in videos flawlessly and I was awed. I applied it and it didn't look flawless, it looked like a hot mess and not a good kind. I never used it again until one day when I was at CVS and I decided to try it again. I know makeup junkies love the Milani eyeliner so I thought "I'm off to a good start." I'll admit it took practice, lots of it to get my eyeliner to not look like a 4 year old drew a black line on my eyes, but eventually I got the hang of it. The pigmentation is quality, the formula slides on with ease, it doesn't crack or flake after longwear. It doesn't come off till I take it off. It's not the easiest to learn how to eyeliner with but I like that I can sorta paint it on. It's definitely worth the hype to check out. 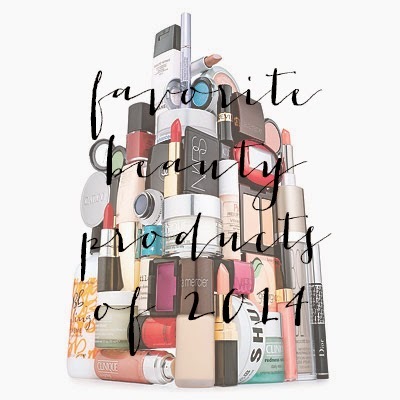 What were your favorite beauty products of 2014? What products do I need to check out? Leave me a comment letting me know! Happy beautifying and Merry Christmas!